Hey all, welcome to the Remarkable Ink Big blog hop and Happy Mothers Day to all the moms' and furry baby moms too! Yes, I'm a fur baby mom and no, he has no idea he's not a human baby. Even when I want to craft, he's right by my side in his stroller with his chewy bone until he falls asleep! Otherwise, he wants on my lap and that sure does make creating a little challenging! Anyhoo, this month's hop theme is Sneak Peek! And I am so in love with this new catalog that I just want it ALL! But for today, I want to share a card I made with one of my all time favorite bundles from the pre-order, Daisy Delight and the absolutely awesome 6" x 6" DSP stack, Color Theory. This paper is so rich in color and the design work is amazing with the crackle look and lots of ombre and paint chip looks, I just love it. I'm really loving this new In-color, Berry Burst too. Look how rich and bright this color is. 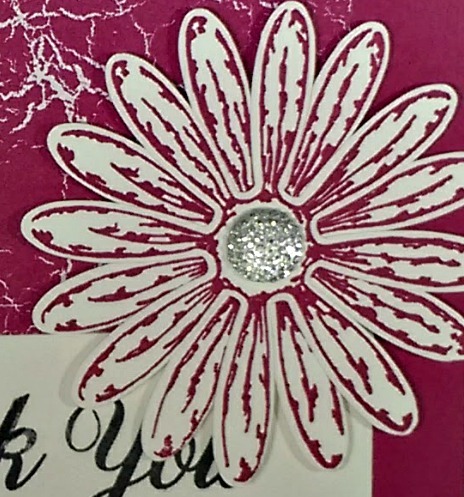 It literally just pops off the paper and I added a brand new embellishment to the center of my daisy. It is one of the brand new Clear Faceted Gems. I used the largest size. Look how it just sparkles! Can you see the glitz and glam? They're just beautiful and I know you're going to love them just as much as I do. I hope you liked today's project. Please feel free to leave a comment below and let me know your thoughts on today's offering for the Sneak Peak Hop. 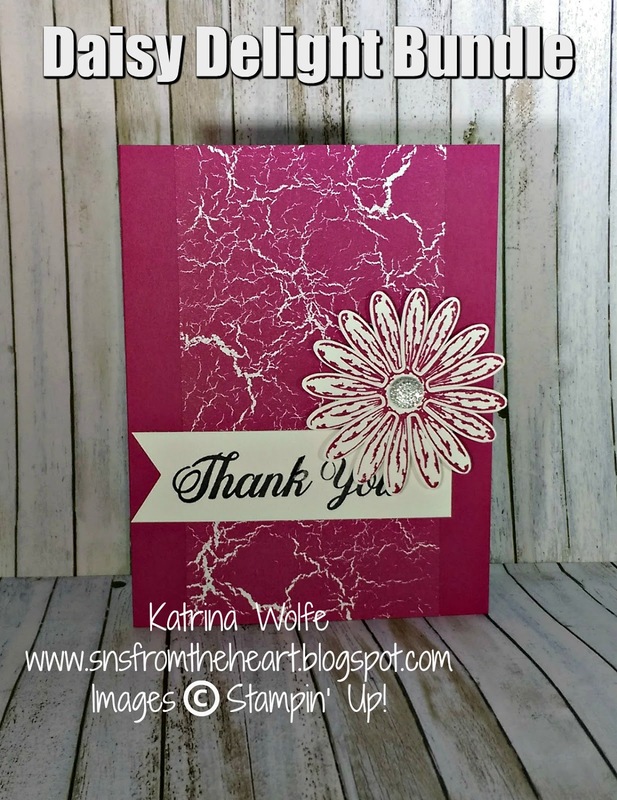 Remember, you are on my blog, Katrina Wolfe -Stampin' n Scrappin' From the Heart, below you will find the list of hoppers, just click the next link in the line up to continue moving throughout the hop for more awesomeness from our talented demonstrators. Just sit back and click through all of the links as I promise you will not be disappointed and you will find some great inspiration to spark your own creativity.